My new project and the return of McNally, Boston PI in a story called Beetle Beginnings. The story is not related to anyone living or deceased and is only to show what is driving this build. 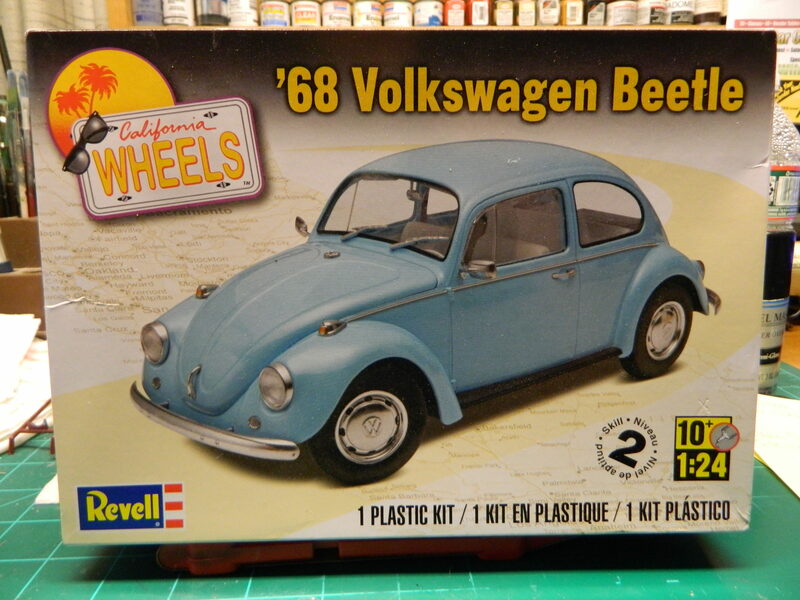 I am using Revell's '68 Volkswagen Beetle kit, #85-4192. It will be painted in a light pastel blue paint that I will be getting later today. 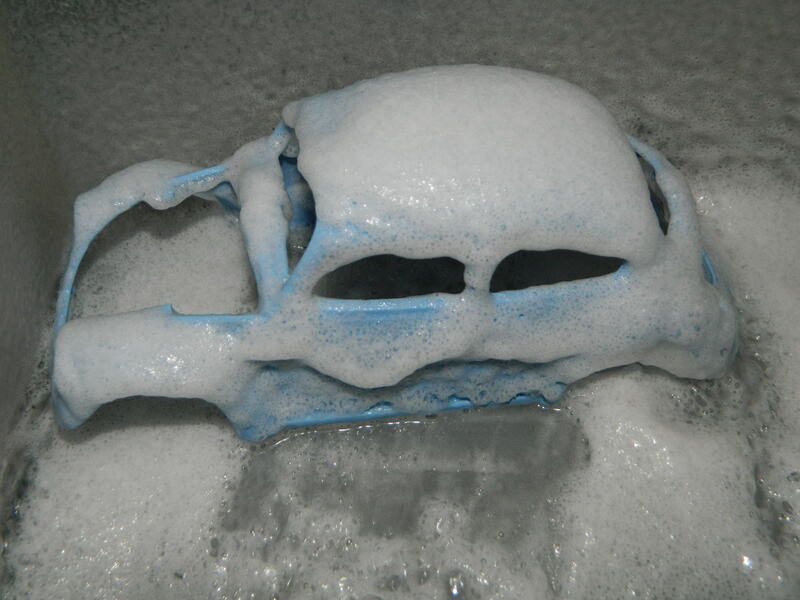 So far, I have cleaned the body of mold lines and will give it a good washing with Dawn dish detergent and warm water. While cleaning out a closet, McNally finds an old photo album with pictures of his Mom and Dad, old friends from school like Johnny Hallis and his future wife, Teresa Burrett, pictures of the house and of the cars the family has owned over the years. One picture brought a smile to McNally's face, a picture of his first car, an old '68 Volkswagen Beetle. He had bought the car from the Estate of Everett Harold Tomlinson who had stopped driving at the age of 90 years old and the car sat in the garage for three years until his death from old age. The family wanted the old car gone as it was old and archaic. They hated the old car as it brought images of the good and the bad times that Everett had lived and suffered through. Young McNally had brought his father along that Saturday to sign for the Beetle with his son. The lawyer for the Estate, Alfred R. Manicottis signed the bill of sale after young McNally and his father, Officer Raymond McNally had both signed the document and the money was then exchanged, $200. Johnny Hallis' father owned a wrecker service and he towed the Beetle to McNally's house and he help park the old car in the back yard next to the garage where young McNally will work on it to get it running again. He'll drain the old gas, perform a tune-up, and get the car ready for State Inspection. But, cleaning out the trash and junk inside the old Beetle will send young McNally down a path of discovery that he has no idea about. Had my first cuppa coffee and just finished chapter one of "my" new book. Its going to be a page turner! Looking forward to this. It's a nice kit of a European spec 68 Bug. Thanks guys! I hope this story is interesting enough for you all! To me, this is a Beetle, European spec or not! Well, I have changed my mind on the paint color. The only pastel blue I could find is Testors Enamel and I am very down on Testors Enamels right now. Not enough pigment in the paint for my liking and, of course, the drying time. I prefer lacquers from Tamiya or Model Master/Testors. 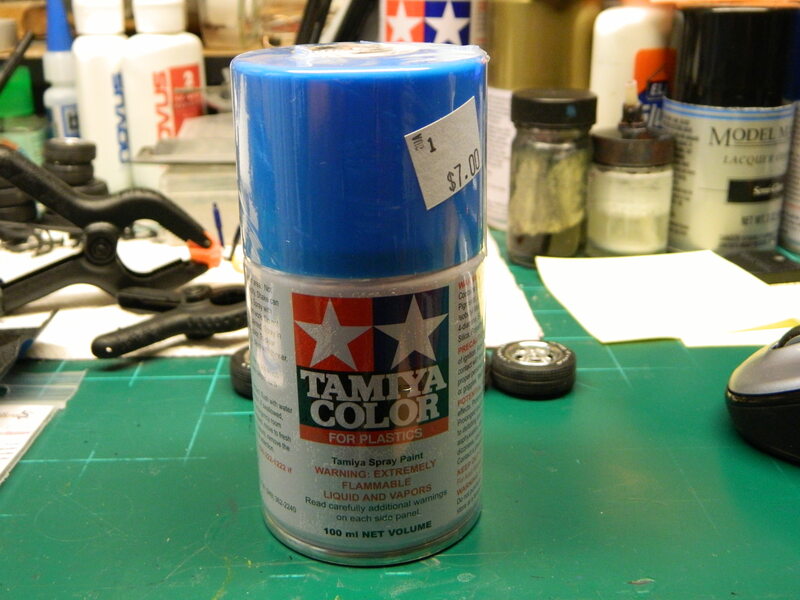 I have decided on Tamiya TS-23 Light Blue, but I may venture out into the heat today and search Home Depot or some auto parts stores for a can of pastel blue. I for one will stay tuned . Your prose is interesting . Your builds are well done . I do not appear muc h here now or move out of the basement as a Lurker . I cannot pay the Ransom to PB for the use of my Photos ! Yup , still angry Thanx. Thank Mike and Dimaxion! Been there with PB and I deleted my account. I have far too many builds to go back and replace all my photos. Besides, my pics are backed up on my main PC and several discs. Almost a week has gone by and young McNally has been picking away at the old Beetle. He pulled out the back seat, disconnected the battery and took it into the garage and place it on the bench in a metal tray, hooked it to a battery charger and will let it sit there for a day or two. The gauge on the charger shows the battery taking a charge. He'll wait until Sunday afternoon when he can pull the wheels off the car to inspect the brakes. He'll inspect the rest of the suspension and takes notes of what will need replacing. It is now Sunday afternoon and Dad is working, Mom has gone visiting her folks on Beacon Hill, and McNally grabs a trash can and pulls it over to the Beetle, opens the passenger door and starts throwing away some old books and magazines a couple of old empty boxes and then he sits in the passenger seat and opens the glove box. He pulls out three packets of now brown ketchup, a bunch of salt packets, some old receipts, an ice scraper, a bottle of dried up touchup paint, the old registration, and the owners manual. He looks through the manual when a picture falls out into his lap and he picks it up and looks at it. It is old and somewhat faded and of an older gentlman sitting and a young child standing on a large boulder with a lake in the background. He puts the picture in his pocket and will make an attempt to return it to its rightful owner. I had another reason to go out today, my living room A/C took a crap on me and I went out and bought a new portable unit so I am not lugging that one out of the shed and throwing out my back. 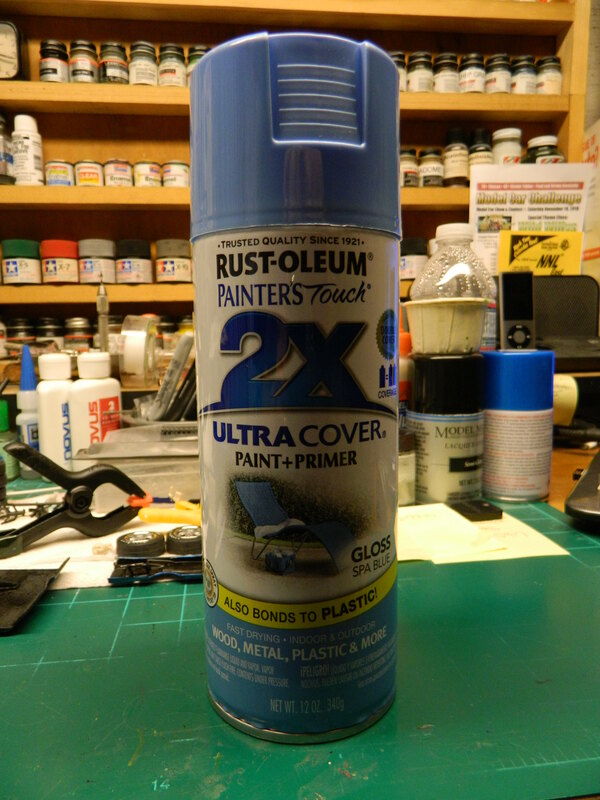 While I was out, I stopped at Home Depot and looked at their spray cans and found Rust-oleum Gloss Spa Blue for under $4.00. It looks like a pastel blue to my eye so I'm gonna give it a try! After school, young McNally gets a ride to see Attorney Manicottis to ask about the picture he had found in the Beetle's Owner's Manual. The Attorney says he'll ask the family about the picture tomorrow when he meets with them about other Estate matters. He then walks down to City Hall to check into registering the VW. While he was there, he went over to Birth Records to find any info about the rest of the family. Well, I guess you get what you pay for. I didn't like the way this paint layed down on the Volkswagen body. Since I have to go shopping tomorrow, I'll stop at a couple of auto shops and look for paint. 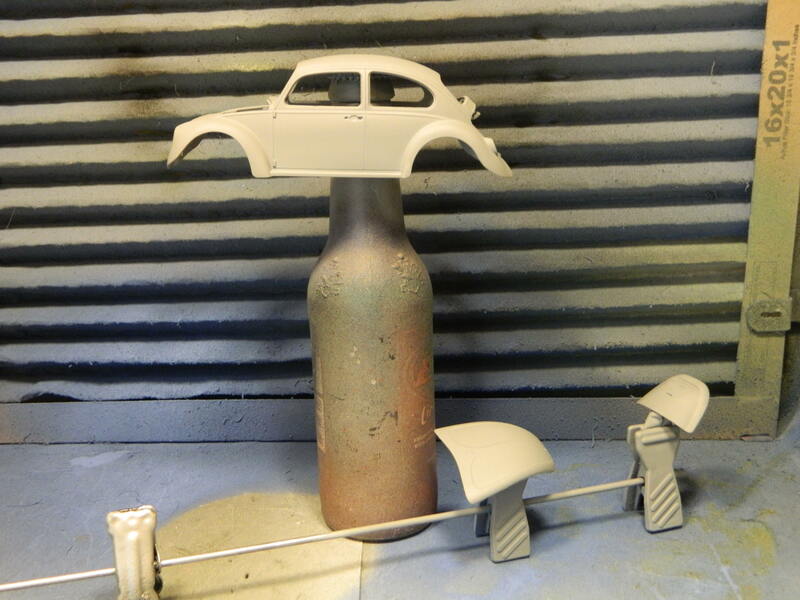 This stinks since I do like a metallic paint and this VW requires a solid paint. 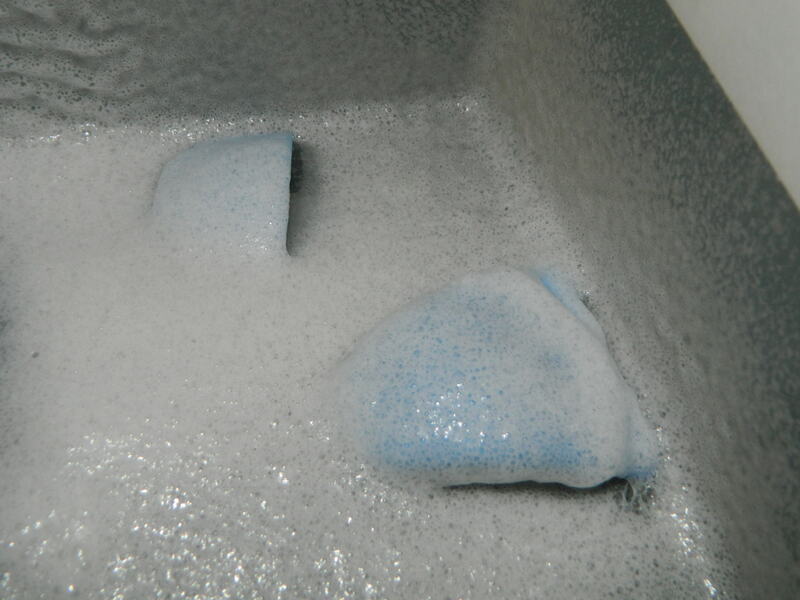 The body, hood and trunk are now taking a Easy-Off bath. I'm dialed in on this one too. I hate starting paint over. I was wondering how that would go when I saw the paint/prime mix formula. Was that the issue? On your AC: you're in NH - all you have to do is open a window! It'll be winter there in a few weeks! Even thought they have some really nice colors, I haven't had luck with Rustoleum or Valspar paints. They seem to stay tacky and don't respond well to clear coats. Krylon works pretty well, but all the local big box stores seem to be fazing them out in favor of Rustoleum products. I don't have an airbrush so I don't know if the problem is with the spray nozzle or the comosition of the paint itself. It's kind of like this...it gets very hot and very humid up here in New Hampshire! I'd rather leave the windows closed and the A/C running 24/7 instead of suffering with this infernal heat and humidity! I'll do this while I wait for winter to return. First off , sorry to hear about your painting blues Mike. Looking forward to the recovery. That's a shame this paint didn't work for you. I love this brand of Rust-o-leum ultra cover. I prep it using a great compatible primer, shoot the color which lays down like glass and then wait a while and shoot my favorite clrear lacquer over it and then rub it out to a glossy shine. Getting ready to shoot a '57 Ford 'vert with a color very close to yours. Same paint again. I hope things go better the 2nd time around. Thanks guys! At this point, I'm going to use Tamiya TS-23 Light Blue after cleaning up the body, hood, and trunk lids and then alter my story slightly to include the color change. As disappointed as I am right now, this is just a small blip on the build and I shall work through it. I can get a paint called vw blue at work. I could paint it for you. Pm me if interested. I appreciate the offer, but repainting will be done by me with my backup paint. Thanks Lee! Young McNally returns home from school this Friday and he is not scheduled to work at Piccolo's Hardware tonight. He changes his clothes and goes outside to work on the Beetle. He decides to wash and polish the old car to see just how bad the body and paintwork really is. 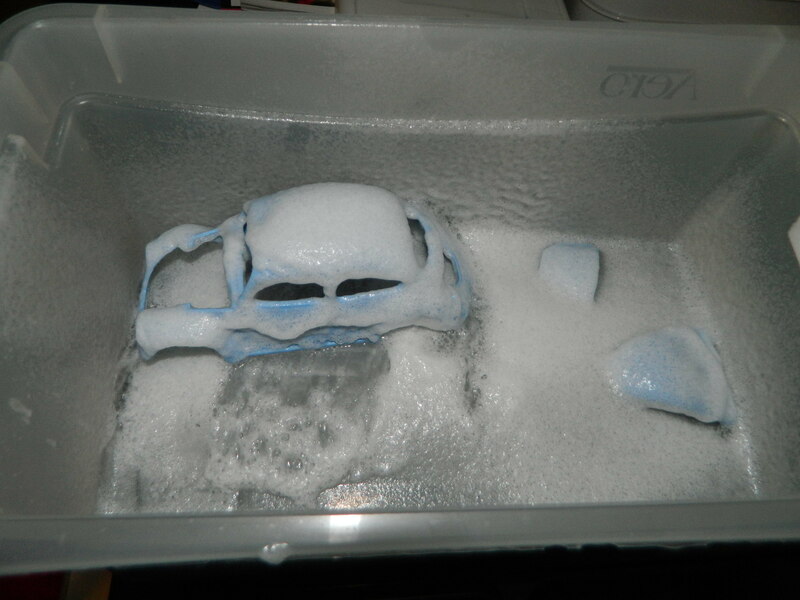 With a bucket full of warm soapy water and a sponge, he starts scrubbing and it reveals a decent re-paint at some point in the old car's life. An inspection reveals that the left rear fender was replaced which may have required a re-paint of the car. The Beetle only had 83,000 miles on it and he is sure that the majority of the miles were put on when the car was young. But, in the back of his mind, the old picture was there reminding him that he needs to find the owner of the picture and who the people were in the picture. 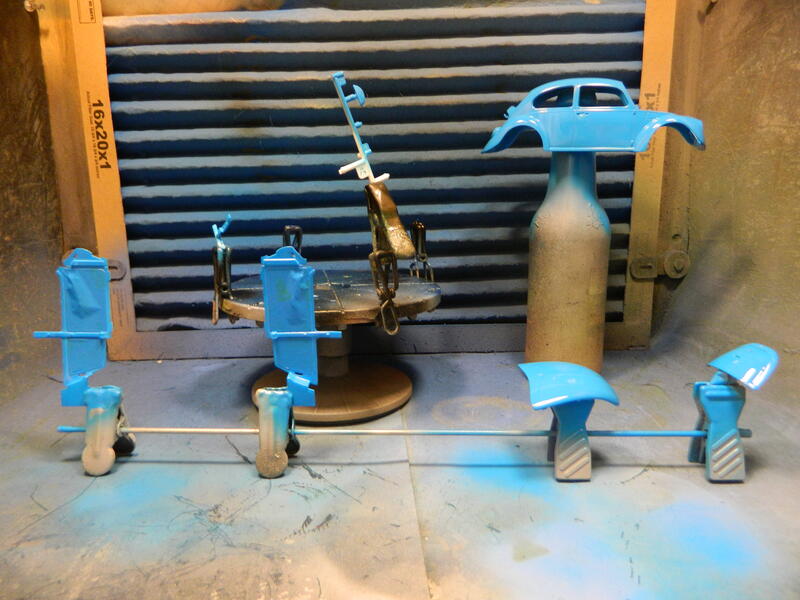 After drying the Beetle, he gets out the polish and starts rubbing the finish, bringing out the shine in the old repainted body. He finishes polishing and waxing the Bug when his Mom pulls into the driveway with her car and a load of groceries. He helps her bring the groceries into the house and then he cleans up and helps with getting dinner ready for them. 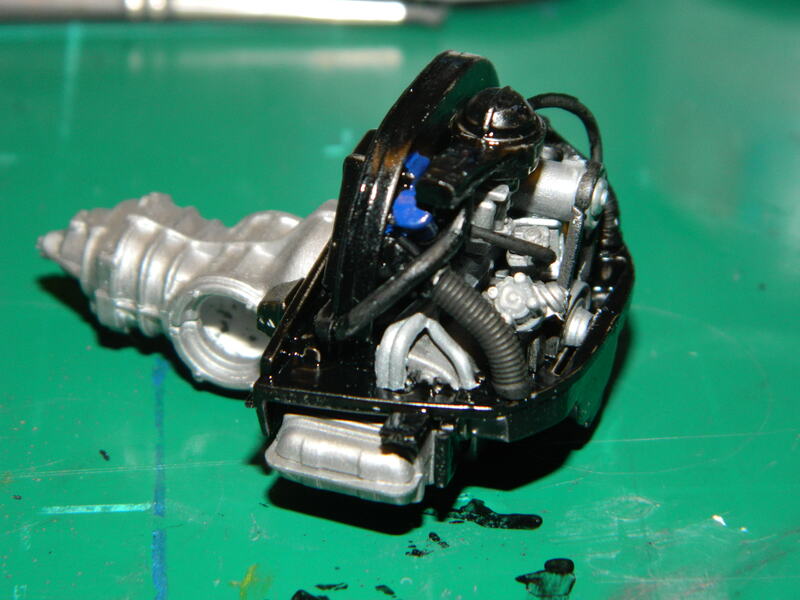 I spent about an hour putting the engine together this afternoon. You can tell that this is a Revell of Germany kit inspite of the Revell USA packaging. 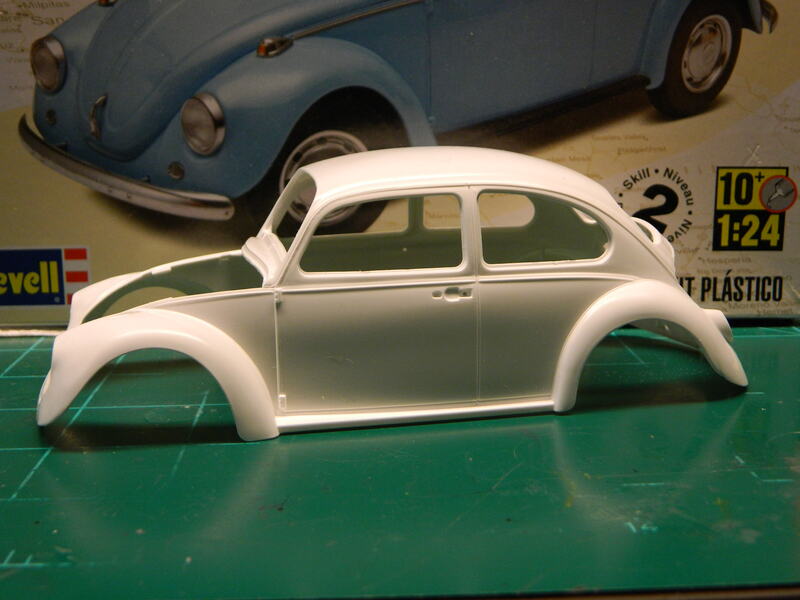 This is fine with me since this VW kit is a very nice kit with positive mounting points and really good molding. 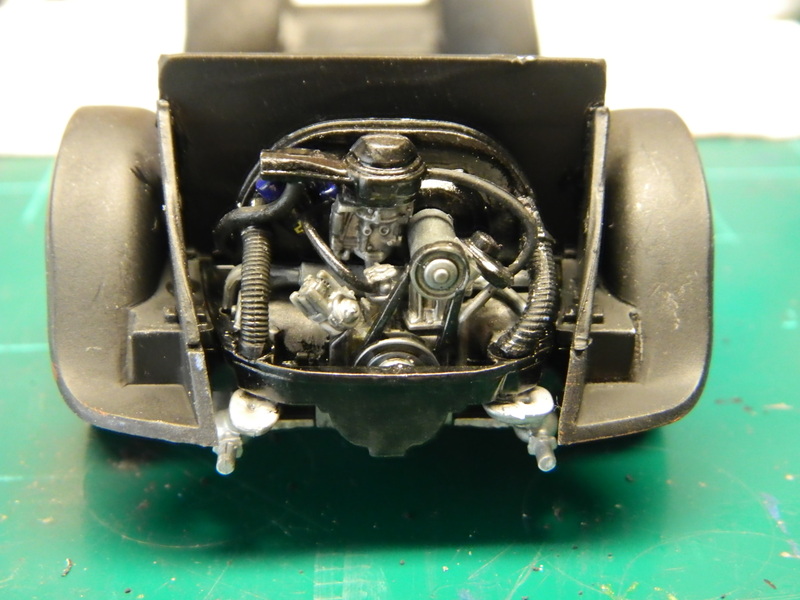 I was going to wire the engine, but now that the engine has been assembled, I think it's a little too late for that now. Its an awesome kit, although a bunch o f people were complaining about it being a European version. I still like. It has real nice features. I like the headliner. Real nice. 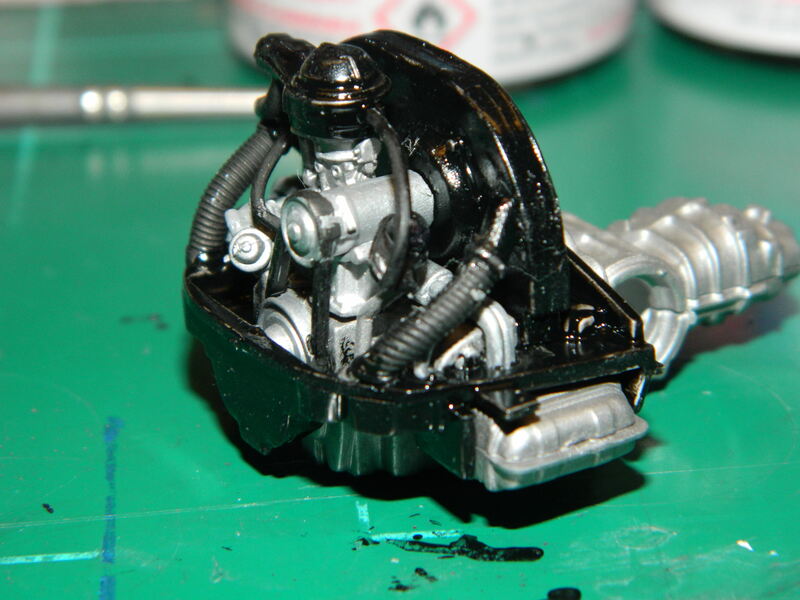 Sorry to see the paint didn't work, but that engine is looking good! Thanks guys! I've got new paint, Tamiya TS-23 Light Blue. But I have to finish cleaning up the body with some sanding. Young McNally takes a seat at the dinner table with his mom. Tonight, they are having fried chicken, corn, and mashed potatoes. His Mom asks about his day and he tells her about school work and the Beetle. He mentions the picture he found in the owners manual and he shows her the picture. She says that she doesn't recognize anyone in the picture or anything in the background. McNally says he has asked the Tomlinson attorney about the picture and he will ask the family about it. Young McNally hopes to be able to return the picture and move on with the Beetle. His Mom knows that he can become a little narrow-minded once he starts focusing on a subject, and this picture is no different. He tells his Mom that all he wants to do is return the picture to the rightful owner, but little does he know what he will find as he digs up information on the Tomlinson family. I have never weathered a model before, so this is my first. 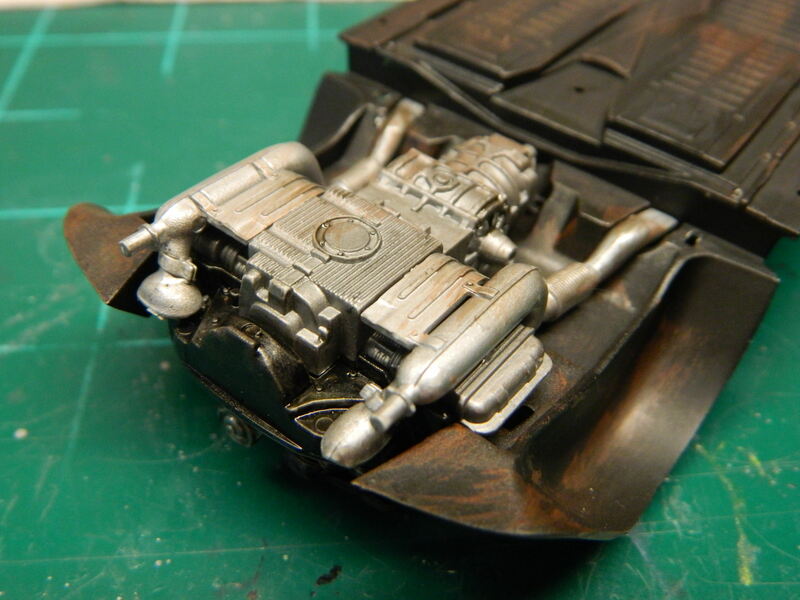 I wanted to weather the chassis and the engine a little to show some wear from years of use. 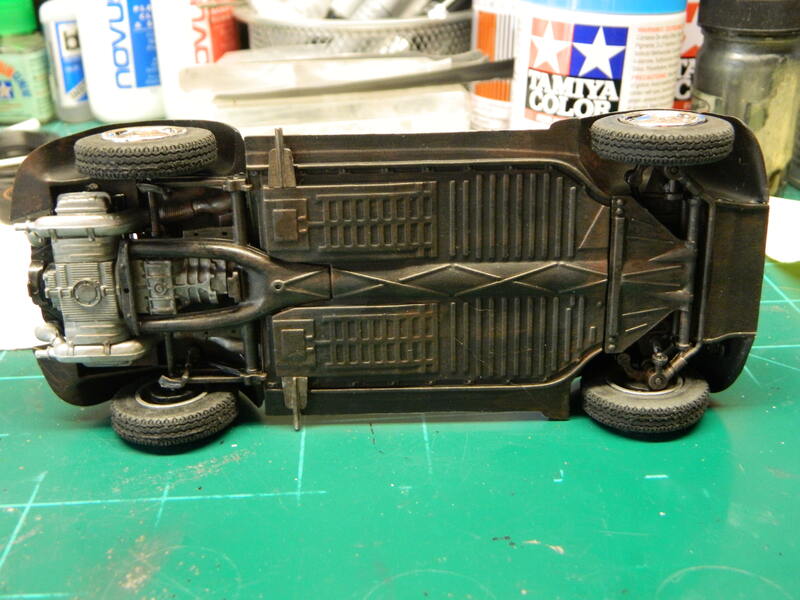 I started with Acryl Rust and I dry-brushed it onto the chassis. 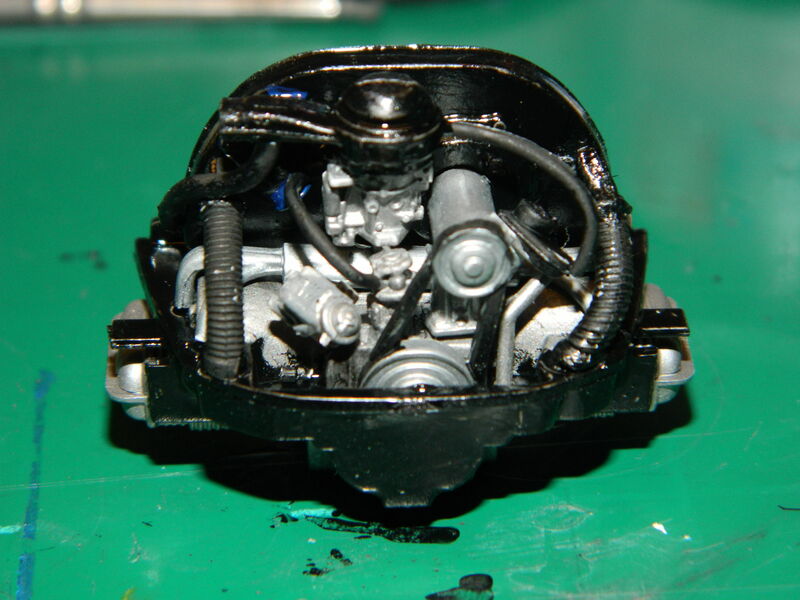 i installed the engine and dry-brushed some Tamiya X-19 Smoke onto the engine with a little Acryl Rust. Young McNally is in his room doing his homework and studying when he hears the doorbell ring downstairs. His Mom answers the door and he hears her talking to someone, but he is focused on his homework and he doesn't pay any attention to what is going on downstairs. That changes when his Mom calls upstairs to him to come down to the living room. He is then introduced to Richard Tomlinson, Everett's son who wants to see the picture and young McNally gets the picture from his room and brings it down to show Richard. Richard looks at the picture front and back and says to throw the picture away and he leaves to the house with McNally and his Mom looking at each other and wondering what just happened. There is a small waste can next to the coat rack by the front door and McNally tosses the picture into the trash and goes back upstairs to continue studying. The following morning, young McNally is putting his books into his back pack and he finishes getting dressed for school. He goes downstairs for breakfast and puts his pack by the front door and he sees the picture in the trash can. He pulls the picture out of the trash can and places it inside his back pack and then goes into the kitchen for breakfast. He will try to find out more about the picture after school. 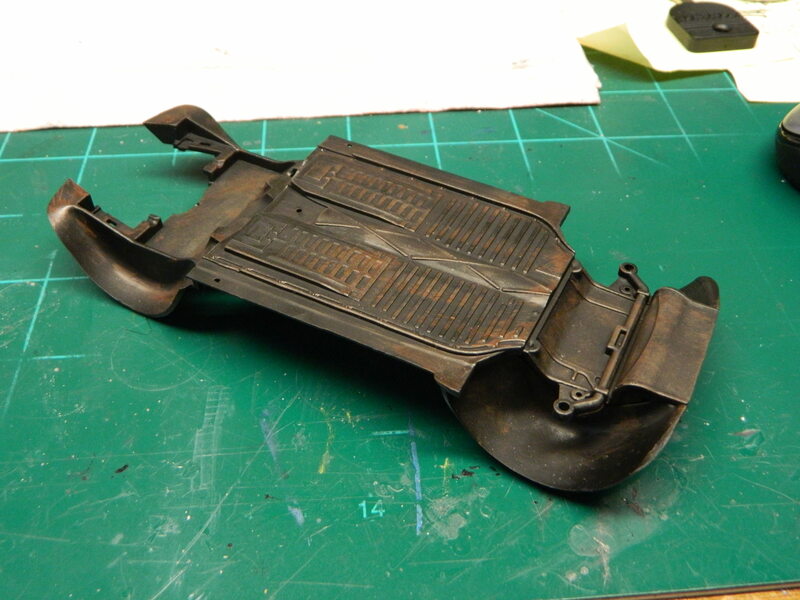 I finished the chassis this morning, complete with weathering. 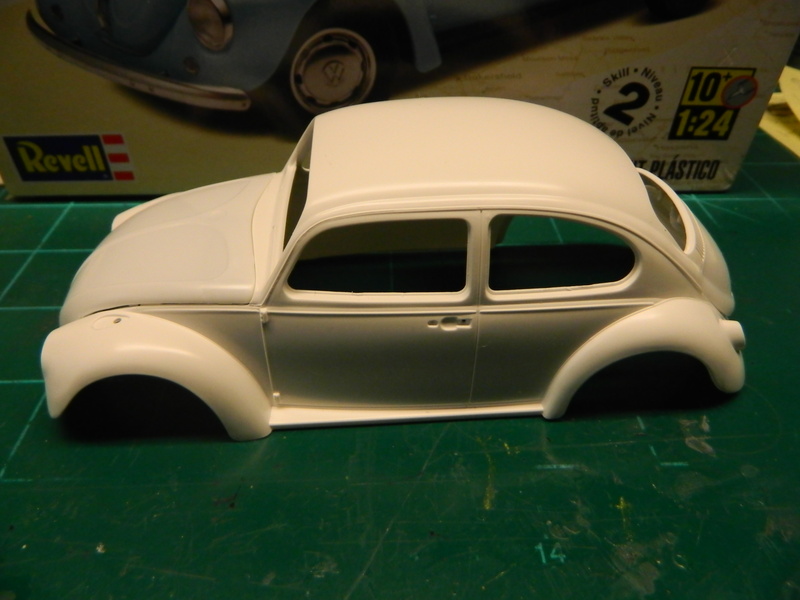 The body, trunk, and hood have been re-primed and will be painted soon with Tamiya TS-23 Light Blue. Thanks midnightprowler! 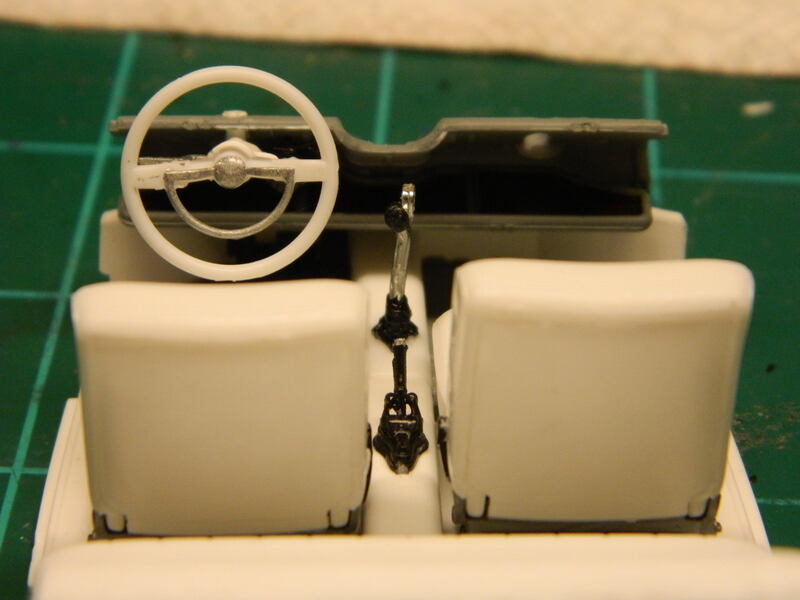 Working on the interior and trying to create a Hurst VW shifter with reverse lockout. Always liked those shifters and it shouldn't be too hard to create. Young McNally goes back to City Hall after school to search birth records and to find any other notices of intent by the Family and the Executor of Tomlinson's Estate while looking for any clues and people he can ask about the picture in his possession. He also discovers that Richard Tomlinson works as a stock broker for Taggert, Mathews, Collins and Associates and they are in a cash flow issue as reported by the Boston Globe newspaper. It was reported that layoffs and even a possible closure of the brokerage might happen. The Police and the SEC are investigating the Brokerage. This must be bad news for investors and stockbrokers alike. He gets home in time to help his Mom get supper on the table. His Dad is working tonight, so it is just the two of them again. After dinner, he helps clean up the table and puts the dishes into the dish washer and then he takes a glass of water out onto the back deck and he sits there and stares at the Beetle still up on blocks. He thinks about the work he has done on the car and the work still needed, then he turns his mind towards the picture and the information he has amassed since he found the picture. He wonders about where all this is going and what he still needs to do. Paint was flying today as I got all the body parts into three mist coats and two wet coats of paint. 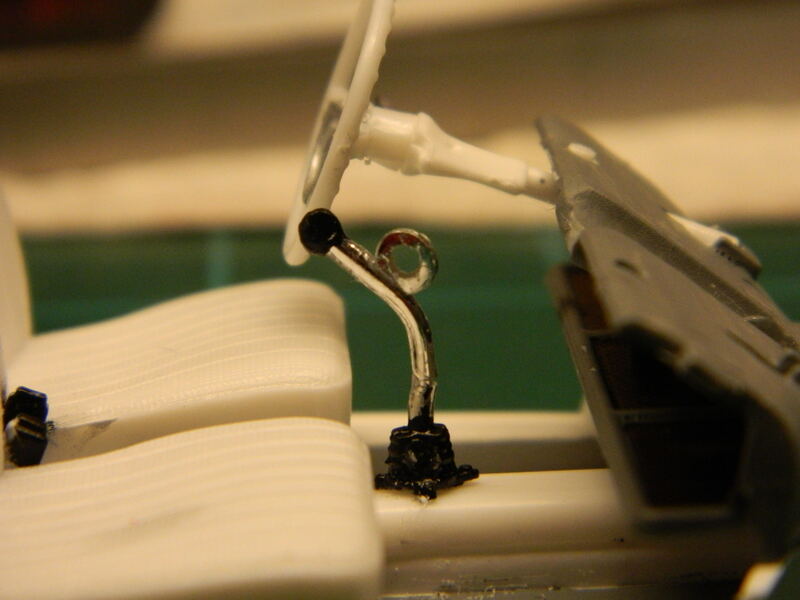 Last night, I attempted to make a Hurst VW shifter with reverse lockout. Not bad, but it could be better. I may try again with a shifter from my parts box. Business at the hardware store has been dropping off a little since a big box home improvement store had opened in the next city over. 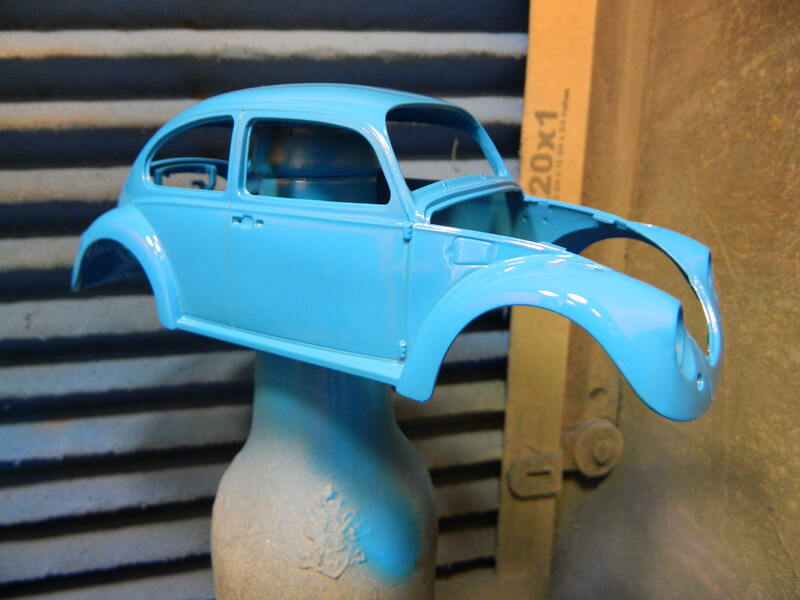 Not scheduled to work, young McNally needed a distraction from his research and decided to work on the Beetle. He was able to find a Hurst VW shifter for the Beetle real cheap and he spent part of the late afternoon installing it into the car. He bought it used and some of the hardware was missing from the box and he was able to find the appropriate nuts and bolts in the garage to finish the install. He takes the old shifter and tosses it into the trash. With his Junior year in high School coming to a close, he hopes to have the Beetle on the road before school lets out for the summer. Right now, he needs to replace the brakes on the Beetle and check over the front suspension one last time. Then the picture comes to mind again and he starts to wonder what is in store for him in his research. After dinner, he goes to his room to study and he picks up his file on the Tomlinson picture and he starts to look through it. He stares at the picture again and says out loud to himself, "Who are you people?" 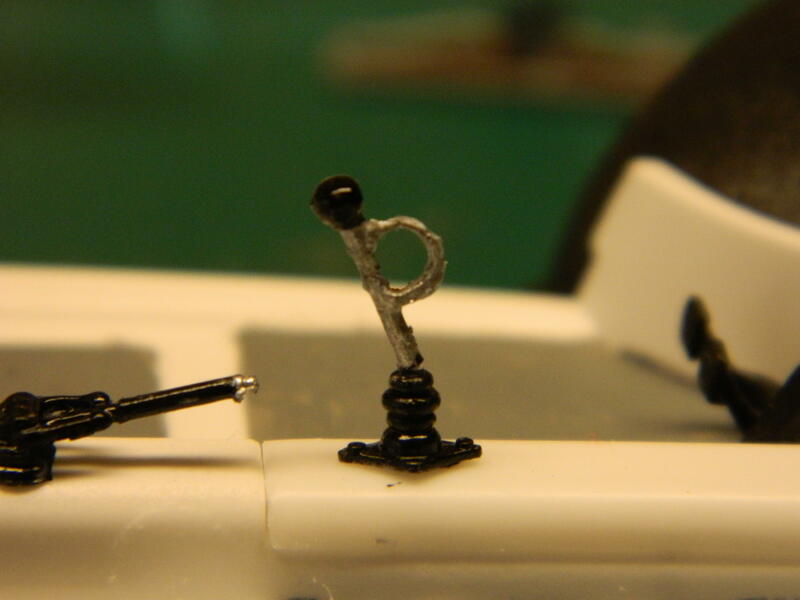 I rummaged through my parts box last night and found a shifter and a piece of chrome plated sprue and drilled a hole in it and flattened one side of it, glued it to the shifter and now I have a Hurst VW shifter with reverse lockout. 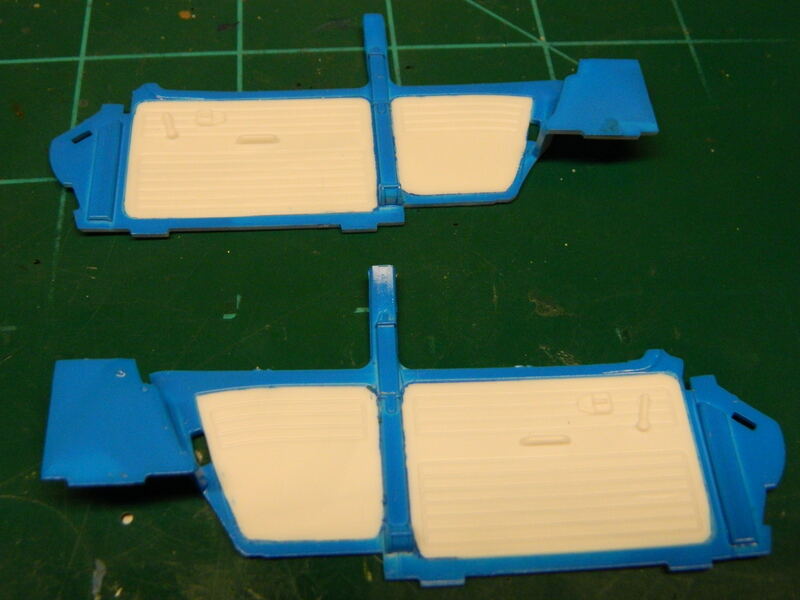 The side panels were masked and painted and now are waiting for detailing. 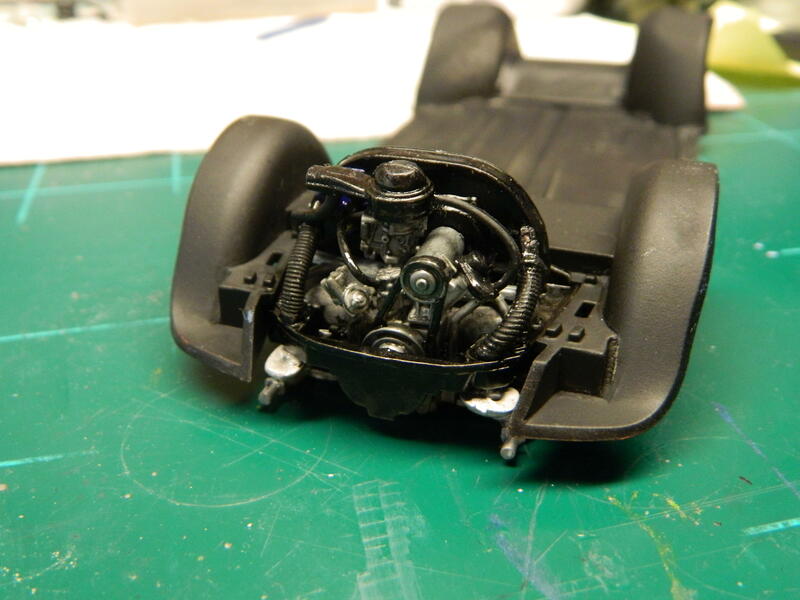 That chassis looks so good you will definitely need to put the car on a mirror!